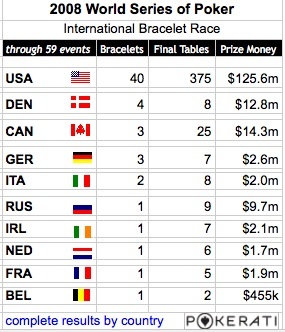 I’m keeping tabs on these big-little tourneys via Steve Hall. UPDATE: Steve tells me that Vinnie is playing these minor league Commerce tournaments for Men the Master. 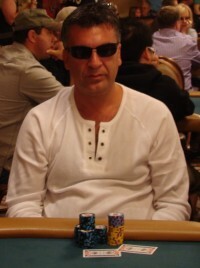 Roland de Wolfe is at the final table in a $1,500 donkament, going for his second bracelet of 2009. 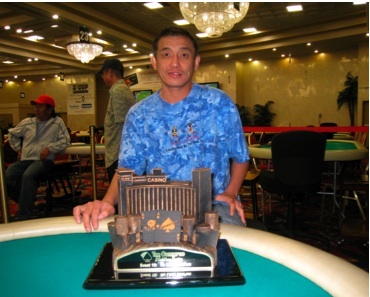 Would be pretty cool to win one in a 198-player PLO-HL and a 2,095-player NLH. The fact that I had him on my fantasy team in 2008 and not 2009 just further reassures me that I am a man ahead of my time. Click here to follow the action online. And here (Bluff) or here (PKR) to watch it live. 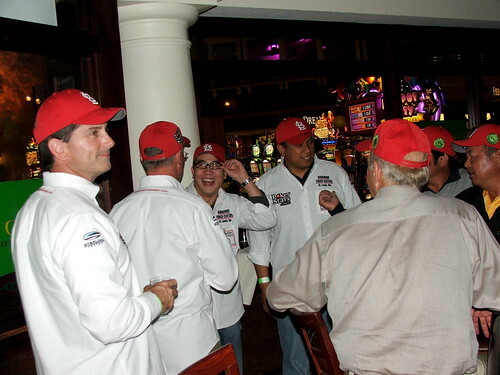 On the stateside front, Pokerati declared California the unofficial capitol of the poker world … but Cali blanked at the main event final table and Nevada had a redraw with WSOP-E — and sure enough, John Juanda et al successfully wrestled away the claim. Vote for Lina, Just Because! Lina placerade sig i pengarna i ett WSOP-event efter att hon Ã¤ven lyckats vinna tvÃ¥ sÃ¤ten till WSOP Main Event till ett vÃ¤rde av totalt 28 000 dollar. Hon gick sedan lÃ¥ngt i online-SM dÃ¤r hon kom pÃ¥ 22:a plats av 1788 startande. Lina kom ocksÃ¥ 4:a i Casino Cosmopols stora turnering i GÃ¶teborg, Spring Poker Week och vann 99000 kr. Hon har spelat in Ã¶ver 160 000 kronor pÃ¥ turneringar under 2008. Right on. I couldn’t agree more. Especially the Spring Poker Week. Sweet as pie, and talented writer and photog … so we’re giving her the offiicial nod. You should, too. Click here and scroll down to vote. This is probably old news to most, but while rummaging through an ESPN media site looking for a pic for the WSOP Europe post below, I came across these stats, which while familiar to me, I hadn’t seen all together, at least not without the summertime Fog of WarSOP clouding my perspective. 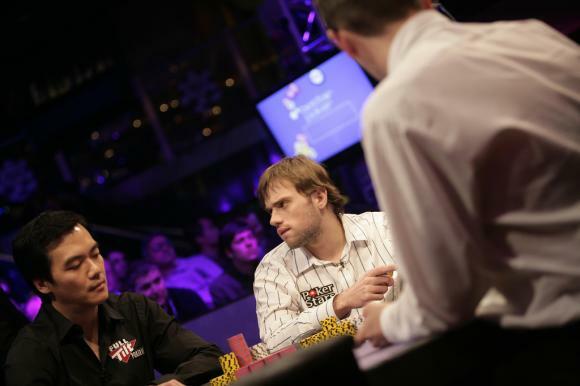 24 – Hour operation needed to turnaround the Main Event Final table Nov 11. OK, hmm, some new poker on TV coming in less than a month that I’m actually interested in Tivo-ing watching. 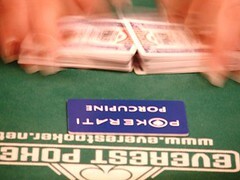 ESPN’s first ever production of WSOP Europe. They’re playing 4/8 Hour-Limit episodes (with Reruns and a half-kill?) — promising a different feel-and-vibe, and introducing the mobile hole card-cam. Alright, I like the sounds of it! Can’t wait to watch the eps with a hypercritical eye and then haphazardly tear apart the hard work of dozens, if not hundreds of people trying to give the whiners and moaners viewers Pokerati readers what they say they want in poker television. Though I doubt WSOP Europe on TV will have quite the cultural impact of similar-length miniseries such as V, Shogun, and The Thornbirds … I suspect it can be equally as catching as From G’s to Gents. Worthy opponent or dead money? The youngest WSOP main event champ in history. 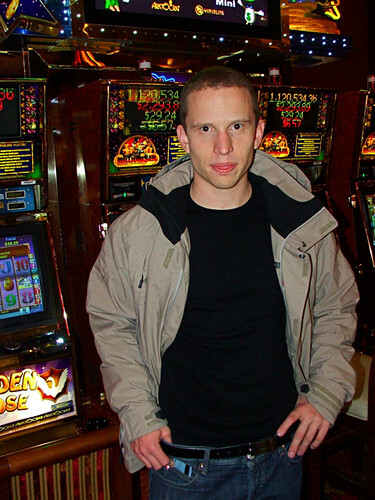 Caught up with Peter Eastgate, 23, as he scoped out the $400/$800 NLH action at the Golden Nugget yesterday … The reigning WSOP champ goes into today’s HSP game down $100k — if you consider the results of a warm-up session at Bellagio (against Daniel Alaei and Bryn Kenney) part of the same trip — and speaks about what it’s like to play with a freshly inflated bankroll against more experienced players in bigger games than you’re used to. Curiously enough, the guy he really fears at this table is the only dude younger than he is — 22-year-old (Fort Worthian?) Tom Dwan, aka durrr. I picked up my toke check from the final table on Thursday. I got a grand total of $9.37 for my 8 main event downs so an extra $1.17 a down. WSOP dealer tipping is always a prickly issue, you know, give or take a few million. But hey, the penguins dealt the turns and rivers. 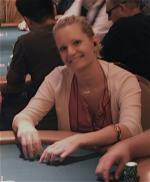 So clearly, it’s all in their hands: WSOP dealers reap what they sew. No? Kinda interesting because this gave birth to the concept of a TV cliffhanger — which is essentially what the WSOP was going for with the November Nine. Viewers from 53 countries tuned in to see JR get shot … sparking seven months of promotional speculation, and by the time the winner answer was revealed on an historic two-hour special, 11 new countries had signed up the show to run on their networks. Dennis Phillips was the chip leader for four months — possibly the longest time anyone in the history of poker has held onto the biggest stack. And though he got off to a shaky start and would ultimately finish 3rd (winning $4.5 million) he still skillfully survived a roller coaster session to be the Last American Standing. When it was all said and done (a day earlier than he had hoped for), he threw a party for his 200 or so traveling friends at McFadden’s (formerly the Tilted Kilt) — and without a heads-up match to worry about, it was some good wholesome relaxed American fun, compliments of a good wholesome All-American player who proved even a bald, middle-aged white guy could inspire a loyal and appreciative following to wear red hats and cheer.